A love of trees and the outdoor life drew Jeff Lanza from Lake Forest, Illinois, to architecture school at the UO in 1981. After two years, it drew him out of the classroom and into his own landscape design and construction business. When he returned to school a decade later in landscape architecture, Lanza drew up an open-space master plan for the City of Coburg as a fifth-year project. "One thing that makes Coburg historic is street trees, especially big-leaf maple," he notes. "It got me involved in community tree issues." 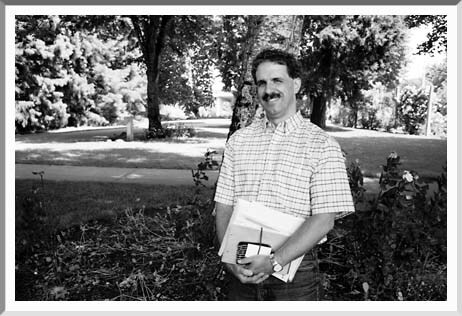 Since 1998, Lanza has worked for Stangeland Landscape Architecture and volunteered with the Eugene Tree Foundation, currently as chairman of its tree-planting committee. "I look on trees as critical public infrastructure," he says. "I keep a journal and scout for locations. We've planted over 1000 street trees since 1999." Tree-planting work parties are scheduled for Saturday mornings in the winter and early spring. The city's NeighborWoods Program provides trees and tools. "Jeff is tireless in getting things organized," says former ETF president Jon Kline. "He's very knowledgable about trees and their habitat."